It has better low temperature flowability that let you have smooth driving experience for the everyday driving, and we have improved high temperature oil film characteristic. It has advantage on high-intensity. Because the stock fluid is very expensive and difficult to obtain, we have made it cheaper and easy to get for regular change and overhaul. 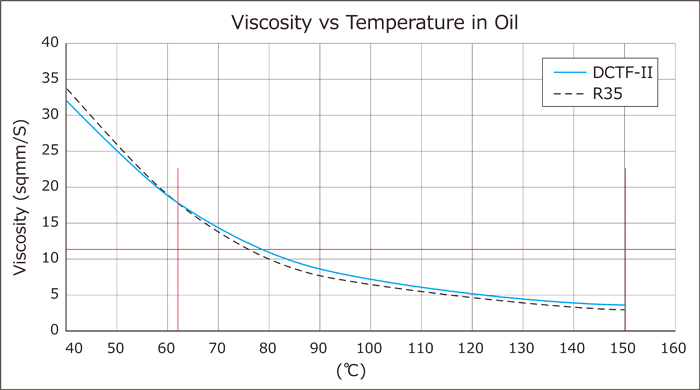 The extreme-pressure performance is improved to provide better abrasion resistance to the gear as compared to the stock, and the oil film stability in a high temperature area is improved by reviewing the kinematic viscosity across all the heat range. This product is compatible with Volkswagens DSG (both wet and dry type) and BMW DCT. 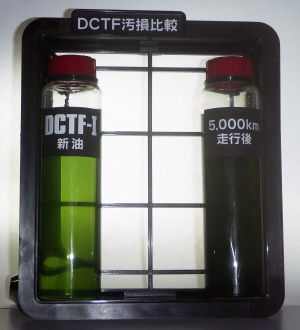 ※DCT is a system that gear and transmission coexist in the system. Basically, it is not replaceable. However, continuous sports driving leads considerable abrasion of clutch materials that become floating components made of metal, resin, etc. in the oil, and these floating components accelerates abrasion of the gear teeth; therefore, regular replacement (every 5,000km) is recommended. * HKS R35 test for 5,000km. Right is normal and left is DCTF. You can see clearly here normal mission is very dark.